Joan Jett Biography, Discography, Music News on 100 XR - The Net's #1 Rock Station!!! Joan Jett, born Joan Marie Larkin on September 22, 1958, in Philadelphia, Pennsylvania USA, spent her childhood on the move before developing her love of Rock & Roll in California. Jett, who's been writing great Rock music since she penned "Cherry Bomb" at 15 years old on The Runaways' debut LP; at only 17, she was headlining clubs like CBGBs with bands such as Tom Petty, Talking Heads and Cheap Trick. After the pioneering all-women band The Runaways disbanded in 1979 she embarked on a solo career, a year later she independently released an eponymous effort which was picked up in early 1981 by Boardwalk Records and re-titled "Bad Reputation", it reached the #51 spot on the U.S. Pop Albums chart backed by a roaring version of "Do You Wanna Touch Me (Oh Yeah)". Jett with manager and co-writer Kenny Laguna created their own independent record label, Blackheart Records to release recordings by her new band, Joan Jett and The Blackhearts; with the group she recorded the single "I Love Rock 'N Roll" which spent eight weeks at #1 in 1982 and spurred 10 million sales of her LP by the same name. This album contained another U.S. top 10 hit: "Crimson And Clover". The band's next record, simply titled "Album", followed in 1983 and peaked at #20 on the Pop Albums chart. It included two top 40 hits: the cover of Sly And The Family Stone's classic "Everyday People" and "Fake Friends", the latter of which crawled up to #18 on The Mainstream Rock list; the final single, "The French Song", was another Rock radio top 30 hit. 1984's "Glorious Results Of A Misspent Youth" charted only at #69 on The Billboard 200 and failed to generate any significant singles. Two years later "Good Music" did even worse, stopping at #161. In 1987 Joan Jett scored a new Top 40 hit with "Light Of Day", written by Bruce Springsteen, performed by Joan Jett and Michael J. Fox and featured on the soundtrack for the movie of the same name, the single credited The Barbusters (Joan Jett and The Blackhearts) rose to #13 on The Mainstream Rock chart. Joan Jett and The Blackhearts made their return in the spring of 1988 with "Up Your Alley", it rose to #19 on The Billboard Top 200 Albums chart and became the group's second platinum certified LP. The disc featured the crunching tune "I Hate Myself For Loving You" which hit #8 on The Billboard Hot 100 and charted within the top 20 of The Mainstream Rock list; the follow-up single, "Little Liar", was also a top 40 in U.S. and hit #13 on The Mainstream Rock chart. Two years later the Rock icon put out a solo release, "The Hit List", an album comprised entirely of covers; it reached the #36 spot on The Billboard 200 and the main single, AC/DC's "Dirty Deeds", went into the top 40 of The Billboard Hot 100 and peaked at #23 on The Mainstream Rock chart. The sixth album by Joan Jett and The Blackhearts, "Notorious", was issued in August 1991 to little attention. Their next offering, "Pure And Simple", followed in June 1994. 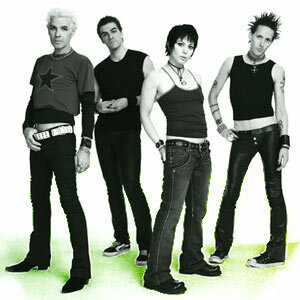 Two years later followed "Sinner"; ten of the songs on this record first appeared on "Naked". One of the new track was the cover of Sweet's "A.C.D.C.". "Unvarnished", Joan Jett and The Blackhearts first studio record in more than seven years, was released in September 2013.